Hi there and thanks for joining me today. At the end of each month I review my team statistics and recognise and reward team members for their achievements. I don't just recognise high sales or recruiting, but send a personal card to someone who may have run an event for the first time, or has been sharing their projects with us on Facebook for example. 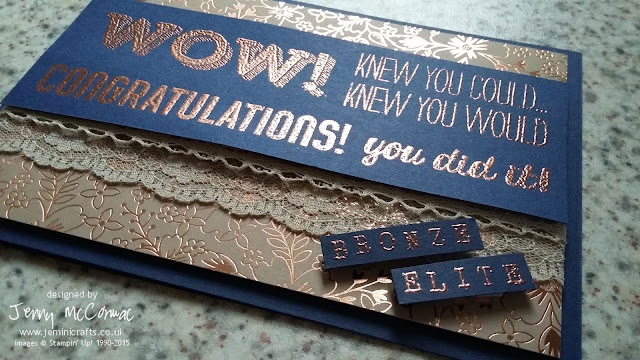 This month I had some team members who reached a certain level and promoted to the title of Bronze Elite. Now our forthcoming COPPER embossing powder is perfect for this as you could get away with it being Bronze in colour on a card. 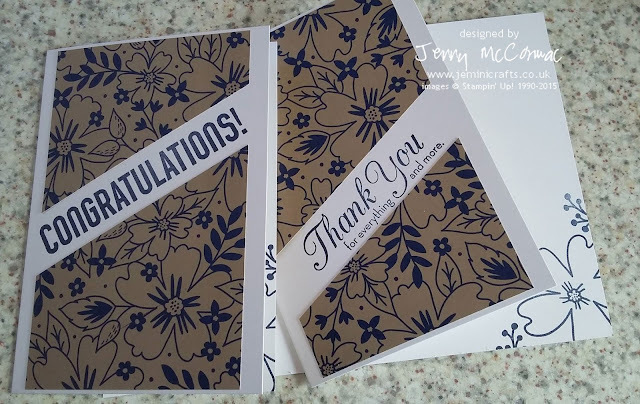 Here is one of the cards I sent out - complete with a Stampin' Up! gift voucher from me as a reward. Along with those specific cards, I sent out assorted Congratulations and Thank you cards to other team members. Both of these cards feature a new set of papers and the cards below also incorporate the matching stamp set which I have used inside the card. I can't wait to share the new catalogue with you that launches 1st June. If you want to be sure and get your hands on a copy REGISTER here for your's today.